Tyson Foods CEO Tom Hayes is full steam ahead in trying to re-shape the food maker's product portfolio. Hayes also shares some business advice he has passed onto his three children. Tyson Foods is hungry to get even bigger. Tyson Foods (TSN - Get Report) CEO Tom Hayes isn't done cooking up big deals. "We are going to be acquisitive," Hayes told TheStreet. "It doesn't mean that it will be another year and a half [until another deal] or this fiscal or calendar year, but it may." If Tyson's current pace of deal-making is any sign, investors should expect a few more deals before the end of the year. In May, Tyson spent $850 million to buy the poultry rendering and blending assets of American Proteins, Inc. and AMPRO Products, Inc. The acquisition will enable Tyson to recycle more animal products for feed, pet food and aquaculture. It will also expand Tyson's presence in the animal feed ingredient business. Then in early June, Tyson scooped up privately held Tecumseh for an undisclosed price. The company is known for its Smart Chicken brand and air-chilled chicken processing -- a departure from water-chilling, the industry standard. 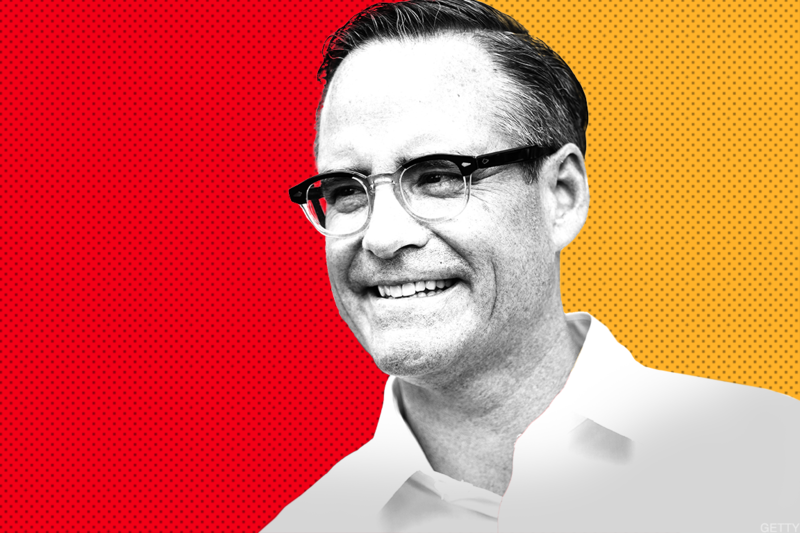 TheStreet caught up with Hayes to discuss his ongoing push to reinvent Tyson Foods. The father of three young adults also shares some business advice he has passed down to this children. What follows is an edited and condensed version of the interview. Tom Hayes, Tyson Foods CEO. TheStreet: It seems like Tyson has picked up the pace of its deal-making this year. Were these deals in the pipeline or were you feeling competitive pressure to get them done? Hayes: American Proteins Group isn't necessarily one that would have been on anyone's radar screen in terms of a classic consumer packaged goods investment. But it is very aligned with the acquisition filters we often talk about. What we have talked about is that we want to continue to try and stabilize earnings and grow the business and have said we would look at three primary filters. They include branded businesses, businesses that brought new capabilities and businesses that brought new geographies. To the extent we could get synergies, that would be icing on the cake. This was not a branded business for sure. But it does give us more capability in an area we needed, it's essentially recycling byproducts into pet food. It's not a tremendougly glamerous business, but the financials are really good. We bought the company at a good price and I think we wil make it better. For our investors, it was a homerun. TheStreet: You definitely surprised the market with that purchase. Hayes: You are not the only that was surprised because we have a lot of investors that follow us that automatically assume I come from Hillshire Brands/Sara Lee, that everything we do will be a branded deal. But if we need capabilities and find something that can help improve our bottom line as well as give us that stabilizer earnings effect we will do it. We have been tracking American Protein Group for a number of years and building a relationship. It just so happens we were able to do this with a direct relationship, there was no one else involved. TheStreet: And the second deal of Smart Chicken? Hayes: It's something we have been looking at for a while. A lot of those types of companies are in our pipeline as we look at areas we want to buy growing companies and segments, organic chicken has been growing. This is one we had our eyes on and it did come to a bidding process. For us, the Smart Chicken brand metrics are strong. They have a good model, they make money in organic and have strong margins. It's not easy to make money in the organic business. TheStreet: Done for the year buying companies? Hayes: I can't get specific on whether we will, or won't, do more deals. But what I will say is that our appetite will continue, we will continue to fuel our business both organically and inorganically. We will lever up our balance sheet a little bit and then bring it down to about two times EBITDA. We are going to be acquisitive. It doesn't mean that it will be another year and a half or this fiscal or calendar year, but it may. Because we sold the Sara Lee frozen bakery business, it allows us to pay off some debt and be in the position to do an acquisition to the extent that it is right. It's those properties that will be a real strong return potential to our shareholders. They are hard to come by based on the valuations. But we can pull the trigger quickly. TheStreet: Inflation still an issue? It was certainly top of mind for Fed chair Jerome Powell during his press conference this week. Hayes: We do see inflation, there has been some grain inflation. And so for us, that's a primary input for chicken of course, but also our prepared foods business that leverages a lot of protein. Anytime we have inflation in soybean meal or corn that's something we will have to overcome. And no new news here, but the inflation in transportation continues to be a bear. We are making great progress on pricing, but the driver shortage is real and continues. It's a tough situation, we are still working through it. It's not getting worse, but it's not getting much better. TheStreet: Tyson Foods does a good bit of fresh food sales unlike others in the packaged food space. Do you think your stock is getting unfairly lumped in with a bunch of struggling industry players? Hayes: In some cases we do get lumped in appropriately, think Jimmy Dean sandwiches, Ball Park hot dogs and Hillshire Farm lunch meat. Those are straight up consumer brands. But on the other hand, we do have products that are-unbranded or that are sold in the perimeter of the grocery store, and that's where we are different. Investors probably have a hard time valuing us because we have a broad portfolio. We want to stress we will be growing through the cycle because we are focused on areas that some of those other companies probably can't automatically shift to. We can take advantage of a growing deli space and perimeter. TheStreet: It's Father's Day, and since you are a father of three --- any of them ever ask how to become a CEO? Hayes: That's funny you ask that, I don't think any of my kids have asked that how to become a CEO. My oldest daughter graduated from college and she is working in robotics and warehouse automation. My other daughter works for a PR firm. She just graduated. My son is still in college. They do ask me a lot about what stresses me out. I do tell them that I have a big responsibility and that I want to do the right things by all stakeholders, and we have a lot of them. I mean we have 122,000 direct team members and then they have families. So that is a huge obligation. Sometimes it feels a little bit overwhelming. Certainly some things I observe being a dad is that time moves quickly. I was constantly in the mode of hey, my daughter is now crawling and I wonder when she is going to walk and talk. You sort of feel like you are rushing them through the phases. Then you turn around, and they are graduating. The parallel to business is just taking advantage of the moment and not so much pushing past to the next quarter. To read more executive interviews from TheStreet, head here.